Lawn Irrigation System technology in Bergen County, NJ has come a long way from its early days. Today, we know that water is a precious resource, requiring careful management. A modern irrigation system with precise hydraulic calculation, accurate water disbursement and detailed programming will protect your landscape investment while conserving resources. Horizon Landscape is a state licensed and a certified irrigation contractor in Bergen County, New Jersey, and has nationally certified designers and installers on staff. Our years of experience in servicing and installing lawn irrigation systems in Northern New Jersey mean that you will enjoy a green, hassle-free lawn and years of dependable, economical operation. Lawns and garden areas have different watering requirements. Our irrigation experts can tell you exactly what kinds of irrigation methods are best suited to your individual property needs. Our Bergen County technicians are certified by the major irrigation manufacturers and participate in continuing education at Rutgers University, NJ, manufacturer’s seminars, and in-house training. A properly coordinated lawn irrigation system with quality components can cost more up front, but it pays for itself in reduced maintenance and water costs in a few short years. As horticulturists we know the water requirements of your grass and how they will vary depending on site conditions and locations. This is critical knowledge when designing or servicing your sprinkler system to protect your landscape investment. For Maintenance, Service, and Repairs click here. Lawns and gardens in Northern New Jersey have very different needs when it comes to watering. Properly designed garden systems will ultimately protect your living investment. Rotary sprinkler heads are used exclusively for lawn areas, but garden sprinkler systems must carefully address the individual requirements of the variety of plants that are found in gardens and shrub beds. Shrub beds are most often designed with spray heads. Spray heads can be installed with nozzles of varied heights depending upon the shrub growth, with adjustments of a full circle, half circle or quarter circle spray pattern. As plants grow, the heads can be placed on risers that allow the water to reach areas they otherwise couldn’t when installed in the ground. Garden sprinkler systems may use either spray heads or drip irrigation. Micro-Drip Irrigation System is especially suited for rose gardens, flowerbeds and planter boxes, since the gentle watering is easier on delicate blooms and foliage. It is also ideal for privacy plantings as a more efficient and economical way of distributing water than with traditional spray heads. For Sprinkler System Service, Maintenance, and Repairs click here. Expert irrigation system design is most important. Even with the best quality parts and expert installation, a poorly designed sprinkler system will not water efficiently or protect your landscape. When we design sprinkler systems, we consider a number of important variables. Lawn areas have different watering requirements than flower and shrub beds. Shady areas need far less water than sunny ones. Trees take a tremendous amount of water and will draw from your lawn and bed areas if they need it. Many different types of sprinkler heads can be selected to satisfy a variety of watering needs. The water pressure on your property will also affect the design of your irrigation system. It will determine how many sprinkler heads can be put on each zone, and in turn, how many zones your property will need to properly water everything. The finishing touch on your new sprinkler design is an easy-to-use timer that will make operating the system a snap. A rain sensor will be installed to prevent the system from watering after it has rained. Well-designed systems allow you to enjoy years of convenient and efficient watering. We have Nationally Certified Designers on staff to ensure that all your landscape watering requirements are met. 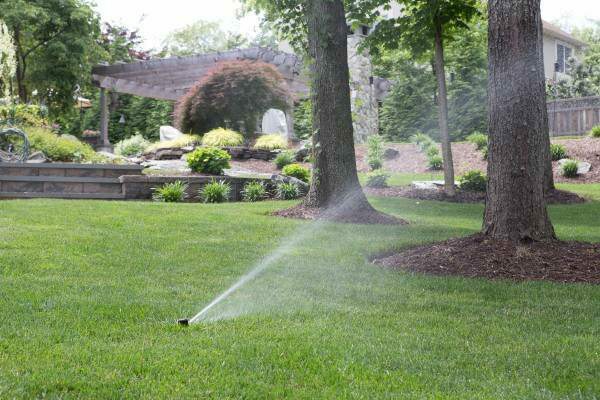 Horizon Landscape’s professional irrigation designers will be happy to assess all of your watering needs and create the perfect garden sprinkler system for your home. Visit Understanding Sprinkler System Parts to learn about the components that will become a part of your new system. We often choose the best parts from each manufacturer in order to install the best possible quality sprinkler system. Typically, we install the timer in the garage for convenience, and we install all heads and valves as designed. When completed, the system is thoroughly tested and adjusted for accuracy. Your site conditions also play a role in which manufacturer’s component we use. The end result is an efficient, well-constructed sprinkler system that will function with precision for many years. A new sprinkler system consists of sprinkler heads, valves, a backflow preventer, a timer, wiring and pipe. The pipe is put into the ground with a pipe-pulling machine. Instead of digging unsightly trenches, this machine leaves only a narrow trail in the lawn which usually grows back completely in 1 to 3 weeks, depending on the weather. Some trails may take longer to disappear when the weather is hot as the grass does not grow as quickly. For commercial or residential irrigation system design, service and installation, please contact us. Call Us Today! We have used Horizon to service and to add to our existing sprinkler system. The techs that have come to our home have been professional & courteous. Horizon has done a great job at a reasonable price. I would recommend and continue to use their services.